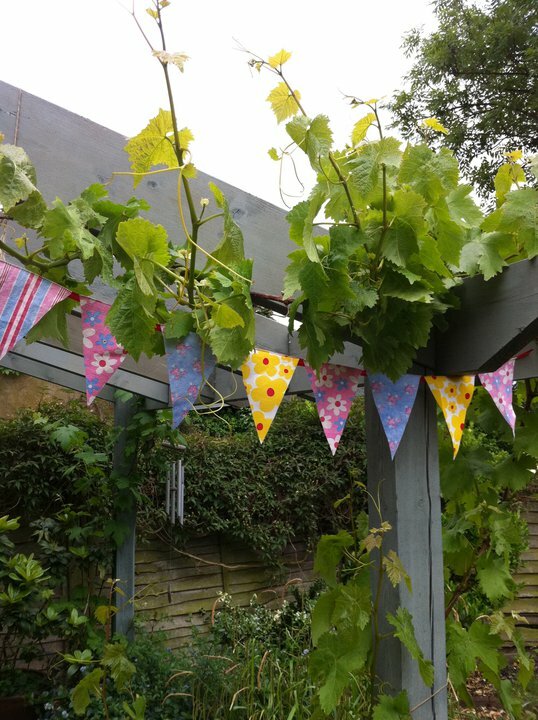 Our big adventure, a plant fair and some bunting! Scarlett has always been quite interested in vehicles - tractors (red ones), buses, 'amb-lances', bikes, 'air-planes' and trains have been in her vocabulary for a long time. When the opportunity came to take her to see Peppa Pig's Party at the Marina Theatre in Lowestoft I thought we could have a real adventure and travel by train. I kept it all secret. We had our Pyjama Drama class in the morning, and then raced home to get her dressed and ourselves to the train station. I bought her a 'mag-zine', myself a paper (still unread) and we hopped onto the 11.08. Her little face was a picture, so excited and happy to finally be on a train. 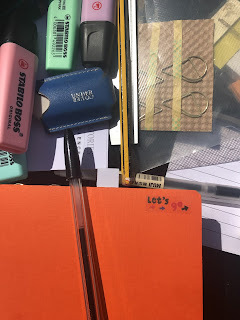 She was good company, we did some drawing, had a picnic and we looked out of the windows. 90 minutes later we arrived. Peppa's Party was OK although a bit old for her I suspect. When you are three, you really don't understand intervals, and you are probably happy to go home after 30 minutes. By the middle of the second half, Scarlett had enough and I was left watching puppets with a screaming, angry little person face down on the carpet. There was a moment of calm when I bought her and her cousin a £1.50 plastic windmill outside, but once we were back at the train station the tears returned. What had seemed to quick journey out became interminably long on the way home. Much of the time, Scarlett was rolling on the filthy floor - but I just couldn't face the confrontation. Some of the time she cuddled me and sucked her thumb. I was so pleased to be back in Ipswich and took two paracetamol as soon as I returned home. Sadly, Peppa Pig's Party has not been mentioned - not once, not even when she has seen her on the television. Far too much squeezed into one day for one so small? On Sunday we took it relatively easy and visited Helmingham Hall for a Plant Sale. It was a really windy day but good weather and just the most beautiful surroundings. 15 minutes from my home and I have never been before. Incredible. True to form I spent all the money in my purse (I don't seem to be happy until it is empty) but came home with no plants. 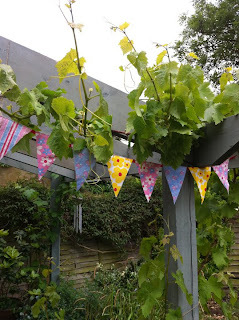 I have been making garden bunting using old Sarah Smith dishcloths. My kind of easy! Helmingham Hall looks lovely, sounds like Peppa Pig was traumatic, I remember those days of old, thank god my two are grown up now, although Sam would probably throw himself on the floor kicking and screaming if I took his XBox away! Loving the bunting how very thrifty of you!